Sophie with palette at the Florence Griswold Museum. December, 2015. The Florence Griswold Museum has a wonderful tradition of inviting several artists each year to create a palette for their holiday trees. A small wooden panel cut in the shape of an artist's palette is provided and the rest is up to the artist. For my palette I decided to create a piece in line with my "Spectator" series, using the lyrics from the popular Christmas song Santa Claus is Comin' to Town for inspiration. The models were my daughter, Sophie, and my husband, John, for Santa's eye. Each holiday season the museum displays the palette collection on trees in the galleries and it is quite fun to see the variety of styles, subjects, and media. 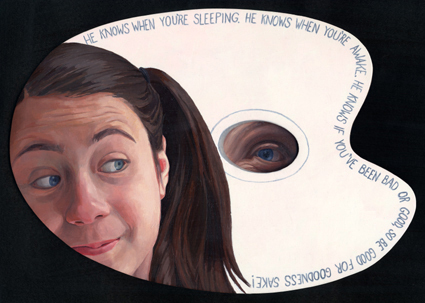 Catherine Christiano, You'd Better Watch Out!, 2010, oil on panels, palette shaped panel approximately 7 1/2 x 11 inches.